Today, as is happening throughout the field of design engineering, circuit board design is undergoing many changes as the Internet of Things (IoT) grows. Some are describing this technological revolution as equal to the Industrial Revolution in breadth and impact on our daily lifestyle. There is the exciting potential to make your mark on this new world in unique and unexpected ways. 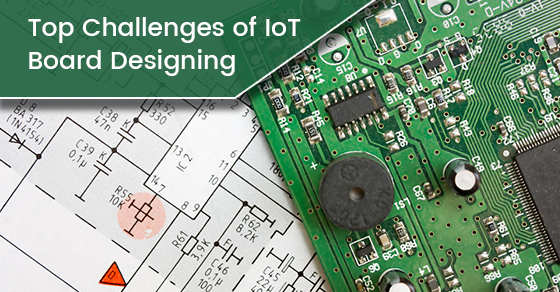 Staying up to date on the issues that are arising in circuit board design for the IoT will give you a competitive edge. The IoT market is moving so quickly that being unaware of a key aspect or trend could mean the difference between delivering a design that shines or one that flops. Here we’ve collected the main challenges you’ll need to overcome to design a circuit board for an IoT device, with tips included. The types of IoT products being designed today are not likely to have a dedicated source of plug-in power. Most IoT devices rely on batteries or energy harvesting tech so efficient power consumption is essential. Rather than focusing on power consumption for the device as a whole, consider dividing up the power budget by assigning a portion to each functional circuit block on the circuit board. It is also incredibly helpful to consult with a component supplier, who may have suggestions for alternate parts that can keep your power budget to a minimum. With the advent of the IoT, we are witnessing a shift in electronics design toward standardization. Reusing blocks of circuitry that have been shown to work reliably and efficiently in daily use is the way forward. This way, you won’t have to endlessly re-design the same block of a schematic, like Sisyphus endlessly rolling his boulder up the hill. With the IoT, the traditional schematic design process is now module design. It is prudent to begin reusing part lists, modular schematics, and parts of layouts that have been confirmed successful in past projects. Circuit board designers must increase their knowledge of overall product design to meet the needs of today’s world. Gone are the days of working in silos and handing off a circuit board design to a mechanical designer for a fit check. With the IoT, given the smaller form factors, each and every stakeholder must be on the same page throughout the design process, from concept development to final testing. Virtual prototyping is becoming paramount. It is being used to evaluate the dimensions of the circuit board, the overall device weight, and whether the board fits within an enclosure efficiently. With devices for the IoT, there is hardly enough space to include all of your tracks, components, and vias. Devices must often be compact enough to be wearable or even ingestible. IoT devices will need to accommodate features such as displays, cameras, microphones, sensors, and more. To include all of these compact functions, tech such as Rigid-Flex circuit boards and High-Density Interconnect (HDI) circuit boards are often used. HDIs are very useful when dealing with limited space because they allow for denser component placement and the use of blind, buried, and micro vias. The bending and twisting capability of Rigid-Flex circuit boards is used to fit multiple circuit boards into a tiny enclosure. Changing out a fried through-hole component on a traditional circuit board is tedious but straightforward. For a miniaturized IoT device, the process is much more complicated. Tolerance of the need for regular repairs is ultra-low within the IoT device market. From smart fridges to wearable devices, consumers are not willing to accept a lapse in functionality. Poor consumer ratings during a product’s initial release can tank a device right from the start, so it needs to just work, and work well. Simulations programs are becoming indispensable in designing circuit boards for IoT devices. These programs allow you to painstakingly optimize all aspects of your prototype for top performance. Thermal management is very important for IoT devices; with multiple boards located in the same space, not to mention sensitive components, locating the cooling correctly is essential. As a circuit board designer in the IoT world, liaising with the mechanical design department goes beyond the stages of virtual prototyping and product planning. During every stage of the design process, ongoing two-way communication regarding changes to the mechanical assembly or the circuit board is key. Unfortunately, there is currently no streamlined process or standardized software for this communication between teams, since every tool uses its own proprietary file format and data structure. In a word, the human body is very ‘lossy’. This is a challenge for maintaining a strong signal when transmitting data to and from wearable tech. The need for keeping electromagnetic fields as far from the body as possible presents many logistical problems. Radiation is of deep concern to the public. Much research is being done in this field, and the use of components such as low-noise amplifiers is becoming more prevalent. Humidity is given off by the human body, which presents additional problems. Humidity and circuitry are not the best of friends, so careful planning is key when designing high-impedance circuits into a wearable device. One solution, from a mechanical design perspective, is to engineer a package that is fully sealed off from humidity. Another solution is to include a conformal coating to the circuit board, which helps prevent moisture from accessing the sensitive components. Wireless connectivity is essential for any IoT product, giving a device the ability to collect, send, and receive data. Finding space to fit components for wireless connectivity can be a great challenge. Today, standardized modules and RF components designed for IoT products are available. These parts are designed to have small footprints and still provide the functions needed. Protocols typically used for IoT products include communication and transport, identification, infrastructure, data, device management, and discovery.